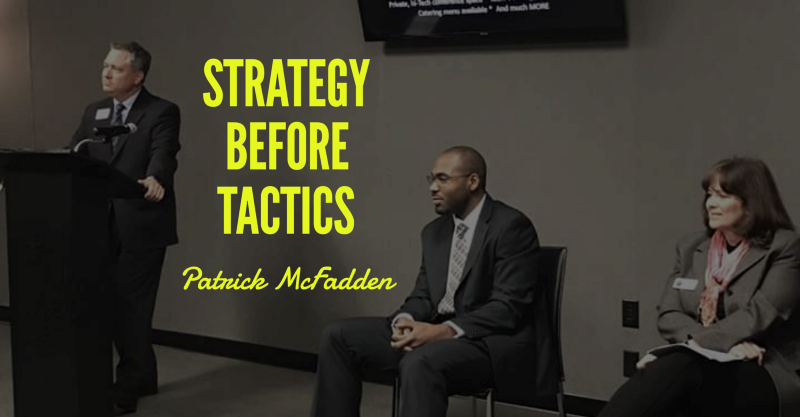 Are You Asking Tactical Questions Before Strategy? Recently, I’ve been getting asked questions, directly and indirectly, related to the tactics a business owner or organization should use to move the needle in their business. Where Else Can I Market My Services? What Suggestions Do You Have for Marketing to Small Business Owners? What Is The Best Way To Market A Salon/Spa To Set Myself Apart? How Do I Get Targeted Customers, Targeted Traffic to My Page and More Likes on Facebook? What Are Good Suggestions for Me to Get Customers Who Don’t Know They Want My Product Yet? How Do I Deal With Competition In My Industry? These questions reveal a symptom of the same painful problem, which boils down to lack of a clear marketing strategy. Even as I write these words, most business owners hear marketing strategy and immediately think websites, email newsletter, copy, LinkedIn, Facebook and promotions — you know, tactics. Heck, most well-known marketers do the same thing. Today, I’m here to affirm that none of your tactics matter until you are crystal clear about a couple of strategy things. A marketing strategy will focus your efforts on attracting your target market and help you determine if you are going off track and what you need to do to reach your destination. The secret to increasing your profitability isn’t more marketing — it’s targeting. Don’t squander your marketing budget and hundreds of hours generating leads that take your business nowhere. Find your profitable client from the outset, and everyone wins. Challenges or Problem — Marketing is about solving customer problems, whether those are problems customers are currently facing, or problems they will face as their marketplace evolves and their needs change. Real Quotes — Include a few real quotes taken during your interviews that represent your persona well. This will make it easier for employees to relate to and understand your persona. It’s hard to argue with any of these assertions, isn’t it? I mean, that’s what you sell — but that’s not the point is it? What you really sell is — what the buyer believes that are getting when they buy your product or service. Funny thing is — many business owners and organizations don’t even know what that is. And, it’s the most important thing there is to know. Especially if you have marketing and sales professionals. The difference needs to be in the way you do business, how you cultivate and build relationships, how you package your product, the way you sell your service, the way you answer the phone, your appearance on a sales call, etc. — its all in the way you provide your service or product. Businesses that build real marketing momentum through strategy strive to do things that no one else in their market is doing or to do the same things that everyone else is doing in different ways. Have you been making these mistakes? It’s not too late to change your marketing. Let’s talk about your marketing, and how to improve it. This entry was posted in Marketing Strategy and tagged tactics before strategy. Bookmark the permalink.